We are dedicated to providing a safe and fun place for children of all ages to come and enjoy bowling. Bowling is a lifetime fitness sport which contributes to your child's balance, coordination, motor skills, and self discipline. It promotes social skills and also contributes to their overall physical, psychological, and emotional health, as well. No one sits on the bench in this sport and achievement is based on each child's average rather than age. We have several great youth programs to choose from listed below. Call 515-576-7664 for more information. We start this year on Sept. 11 @ 9:15 but it's never too late to sign up. Come on out any Saturday morning and we'll get you on a team. Children love to bowl! Register your kid(s) for our Youth Bowling League today! We have organized programs every Saturday morning @ 9:30am throughout the Fall and Winter. These programs include a FREE Bowling Ball for all new bowlers. Call 515-576-7664 for more information. 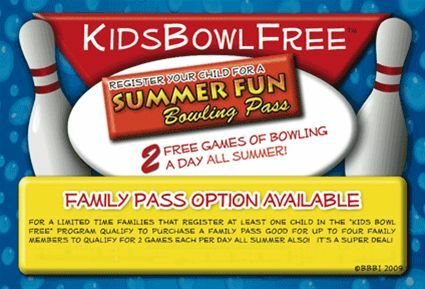 "Kids Bowl Free all Summer"
Register on line at www.kidsbowlfree.com and follow the directions for 2 FREE games of bowling every day we are open through Aug. 31st, 2013. We have been offering this program for 14 years now and this year we have basically only changed the registration process. Take advantage of $$$$$ Savings. get out of the heat and away from the bugs and come and "bowl for the health of it.